I have a Buffet R13 with a fixed thumbrest. But I've got one of those rubber things on it so it makes it quite comfortable. I've read hear that many people regard it as too low. If you thumbrest was too low for you, how far did you have your thumbrest moved up? Is a quarter inch too much? Could you just have them install an adjustable thumbrest? Ron Jr...Comfort of course is a personal matter. Before having new holes drilled, try taking off the thumb rest, turning it upside down and reinserting the screws through the existing holes. This moves the support point up by about the 1/4" you mention. Many people have posted here saying this was just the right change, and it's free. For a permanent change, of course, you'll have to put cork or a silicon rubber tube around it. I had the thumbrest on my R-13 raised 1/2 inch - best thing I ever did! I used to have to stop practicing way before I wanted to just because my thumb ached so badly I couldn't bear it. Now it's not even an issue. And as an added bonus, the Bb/Eb key is now right there where I need it without having to reach for it. 1/4" is not extreme by any mdeans. An adjustable thumb rest may not be a solution, because most are designed to go from a too-low position to an even lower position. I have never seen an adjustable rest set by the player to the lowest position. They are almost always set to the highest position. So what is gained by the adjustibility! I have adjustable thumbrests on my Buffet Prestige clarinets. I still found the highest position too low, so when I was at the factory I got them to move them higher. I agree with the other posters- get an adjustable thumbrest fitted, so that you can experiment to find the right position for oyu. I have a foam rubber earplug taped to my thumbrest. It just happened to be what was available when pain in my thumb got too bad but it works great. It seems that there should be a commercially available product to accomplish the same thing but I've never seen one. Has anyone else tried this? I also had adjustable thumbrests installed on all of my clarinets--LeBlancs Concertos with Bays and Buffets with Selmer adjustables--and have raised them all higher than the original manufacturers TR position. A rule of thumb (no pun here folks) is to position the rest in line with the lower edge of the second tone hole. But realistically, comfort should be your guide. I share your preference for moving the thumb rest. I find it easier on my hand also. I had mine moved half an inch higher on both my Bbs. I'm getting an adjustable thumb rest for my A, since I may decide to sell it, and the moved thumb rest may deter a potential buyer. The new position makes the clarinet slightly end-heavy, putting less (negative?) weight on the teeth. A fringe benefit was easier use of the side keys. On a bass clarinet, there may be a problem reaching the keys with the pinky; I don't have one, so I don't know. Burt: Must be tough to play without a pinky! I've tried a meterial very similar to foam ear plugs...and maybe even cheaper... a 1" long piece of black foam pipe insulation material (a guy thing you can buy at Lowes, Home Depot, or Ace, your friendly hardware place.) They'll probaly charge you a dime. Its a bit thicker foam than the earplugs - maybe providing more cushioning. I slipped it over my adjustable (non-cushioned, plain metal, slippery) R-13 thumb rest and secured it with a small rubber band. If someone sold something like this as a therepeutic thumb cushion, they'd probably get $20! Where do you play in Panama City? Visit this site for available thumb rests. This was discussed some time ago. Rubberbands and silver keys not good case mates?? Or was that just drilled into my head 20 years ago? Rubber in contact with silver plating can corrode the plating right away in quite a short time. It is the sulphur content that does it. Hard rubber mouthpieces also contain sulphur, and probably contribute to tarnishing while a silver plated instrument is in its case. I just spent a week with the Kooiman Etude thumbrest. It's easily installed using the existing screws, and is adjustable to the levels you all mention here. Perhaps it suits someone with a larger hand than mine? I was getting blisters where the thumb meets the hand, and also felt that my dexterity and playing speed was compromised because it felt as if I were playing with paper wadded up in my palm. It was so irritating that I had it removed and the original one replaced. So your suggestions of either raising the existing thumbrest or checking into a different style of adjustable thumbrest are useful. Is there a good reason why Buffet and other manufacturers continue to place it where it is? First: Take off you current thumb rest. Put your hands in a comfortable position on the clarinet, left hand will be the same as always, your right hand should fall into a comfortable, natural position. Your right thumb will probably be higher than the holes left by the old thumb rest. If you then mark this comfortable thumb spot at the higher point; glue, paste, or tape the old thumb rest just above that spot. The new spot can then be tested by actually playing the clarinet for a while, with the rest temporarily in the new place. My thumb rest has been moved up exactly 1", a little more on my A clarinet. All my students have found their own special thumb rest spots with this method, and none of them complain about hand problems any more. Do get a competent repair person to do the drilling of the new thumb rest holes. It does not adversely affect the clarinet in any way, it only improves the comfort and flexibility. Second: Find a good, well made, after-market thumb rest you like. I use one made by Loree, the French oboe maker, for English Horn. It's wider, and beautifully shaped to broadly fit the thumb. Go with any brand you find comfortable, but put away the silly little Buffet, Selmer, Yamaha, etc., one that comes with the new clarinets. I made this change 25 years ago, and I have no hand problems, even playing 4-8 hours a day professionally, every day. Eddie Daniels and I discovered the Loree "Dutch" thumb rest just by accident, and we both loved it immediately. I believe he still uses it also on some of his many clarinets. Loree English Horn thumb rest?????? Thanks for the tip, JJM. I'll check with our English hornist at our next rehearsal to see what they look like. FYI--my Bays are quite wide and comfortable (however expensive), but on the Selmer adjustables, I need to use some extra pading to give them more body. In any case, repositioning the rests higher is essential to improved finger action and over-all hand comfort. And have any drilling for new holes done by an experianced repairperson--especially if you are a home shop klutz like me who always drills too deep. I inverted the thumb rest on my Buffet (gaining about 1/4", maybe more), bought a strap and my wrist pain disappeared. Yes, I've heard that about rubber and silver. I haven't heard the same about rubber and nickel plate, however, in which case "cheapness pays" (my nickel-plated keys were $100 less.) Unless even nickel R-13s have thumbrests that are silver plate - I don't know. But even if my thumb rest turned purple, I don't think it would bother me, especially since 98% of it is covered up with this one inch long black foam rubbery thing that I covet as equal to a $20 therepeutic thumb reenabler. However, if it has the potential of turning my nickel keys some odd color, then I'll replace my cherished rubber gizmo with something else. Do you know if rubbery stuff affects nickel plate? By the way, whatever material the Buffet thumbrest is plated with, when I used it without any covering on it, it turned my thumb black. That wasn't very pleasant. From my research I have the impression that very little is known about exactly what accelerates corrosion of nickel. I know about the polyurethane varnish fumes only from my own experience. Fox plastic bassoons have a significant problem with some corrosive agent in the case. A shipment of new nickel plated Jupiter saxes was opened to find severe corrosion - they were returned. I have learnt from experience to associate some nickel corrosion with fatty cork greases. I, unlike MANY other clarinetists on this post or that I've met, actually prefer my thumb to be underneath my middle finger; the B/F# hole. When speaking to my instructor, he suggested turning the thumbrest around since he told me that the "proper" way to hold it was with the thumb underneath the first finger. I tried it for about a week, but was in so much pain that I gave up and put it back under the middle finger. Will this cause some sort of finger pain in the future? Or arthritis or something? Cause if so, I'll change it around again and retrain myself the "proper" way to avoid a future injury. Thanks. Years ago, the R13 thumb rest bothered me because it seemed too low. I tried inverting it and I also tried a homemade thumbrest made of nickle silver which mounted in the original holes but had the thumb higher on the instrument. These worked fine. However, it occurred to me that I might do better if I rotated my right hand counterclockwise as viewed from the elbow and emphasized that rotation while playing. This puts the thumb lower on the instrument. After trying it a while, I went back to the original thumbrest and feel great about it ever since. The natural position for your hand is with your thumb even with your (if not higher than) your index finger. It's hard to describe, but pick up a glass...how do your fingers line up? All of that said, I don't know why thumbrests are put where they are. I inverted my plastic Yahama's thumbrest, and have never been more comfortable. My wooden horn came with an adjustable thumbrest, which has not been moved from the highest position since I bought it. I'm with Alexi and Wes. With the weight of the clarinet, my thumb hooks down to under my middle finger and I have never had any hand pain (knock on wood). Is it possible that the thumb rest is put where it is by manufacturers because it works for most people there, but that those people aren't speaking out on this board because the subject doesn't hold their attention? A number of you have said that the 'preferred position for the thumb is even with the index finger. I can't imagine that. It seems that then I'd have to use muscular force to hold the weight, rather than just hooking it in a locked position. Holding a clarinet is not the same as holding a water glass, as Bass Clarinet suggested. Having said that, you all have made me think. My right arm is too tense, and my technique is not fast. I've actually had my Buffet adjustable rest at the lowest position, and I will change it now to the highest (about a half inch difference), and see if, over time, it makes any difference. I have just gotten my thumbrest raised (a little over a half an inch) and it has helped for several reasons. First it shifts the overal balance of the clarinet so I have to hold it a little more away from the body. With this higher angle I now must hold my head straighter. This has opened up my my throat significantlly and opened up my sound. Second, the balance is altered so that the mouthpiece presses slightly against the upper teeth rather than on the lower lip. This helps with open G, throat A and Bb: the lower lip dampens the sound alot less. It also helps with the high tones when you have to push up against the upper teeth. Third, related to the second point, is that the weight of the clarinet on the thumb has changed. Formerly, the weight of the clarinet used to rest squarely on the side of the thumb. Now my whole hand position is angled slightly forward. As a result the pad of the thumb is carrying a little more weight. Even though it might not seem significant it has greater comfort. The process was simple. The reparman took off the the thumbrest, attached a rubber thingy and with my fully assembled horn I was able to explore the perfect height. All of the above changes, which individually seem so slight and minor have really added up to a much improved sound. So I can recommend this simple change. I compared some Buffet clarinets this evening, mostly newer ones (R13s, RCs and a Tosca) with the adjustable thumbrest against an older R13 with a fixed one, and the base plate of the adjustable thumbrest is in exactly the same position as a fixed one, so in it's highest position the adjustable thumbrest is the same as a fixed one offering no upward adjustment. Which defeats the object of having an adjustable thumbrest as it only allows the thumbrest to move south. The players are all having trouble with them as they would rather have the thumbrest in a higher position, and with the thumbrest base plate in it's current position (ie. exactly where the fixed one was) there's no adjustment up the joint. Though when repositioning the thumbrest higher up the lower joint (by at least 10mm) it does mean filling in not just the screw holes, but also the recess in between them for the locking screw thread (as well as milling out this recess when the base plate is in it's new location). I take it Buffet set out their joints (tonehole positions and sizes, pillar holes, slots, cut-outs, chimneys, etc.) with either an index roll, or the positions from this index roll converted into a computer programme to control a CNC milling machine which puts the thumbrest screw holes in the same position as it has been doing before, regardless if it's having an adjustable thumbrest or not, rather than changing the programme to drill the screw holes higher up the joint to offer the player the option of being able to set the thumbbrest in a higher position. The ideal position for an adjustable thumbrest should be set so there's an equal amount of movement upwards and downwards. I have moved mine , both fixed and adjustable.not only vertically but also periphically. Gigliotti , years ago at a workshop, reccomended they be moved up, but his hands were enormous. Hand size makes a difference. Try temporary locations first, as others suggested. Jimmy Yan did a beautiful job of moving my thumbrests up about half an inch on my older R-13's. I don't know why they are originally positioned so low, but I never noticed how uncomfortable it was until I got older. In the new position (with Ridenour thumb saddles), I'm very comfortable and can play for hours without hand pain. Not to be off topic, but what is the problem with the nylon pins of the LH levers? If you mean Delron, I just had some installed on both my Yamaha "A" and "Bb" for dampening purposes and so far could not be happier. The nylon pin for the LH E/B, F#/C# is a serious design flaw with the newer Buffets and I hope that the MANY complaints about this issue will make Buffet reconsider going back to the metal tab insert, as was previously found on the last generation of R13's. The nylon pin/dowel is unreliable, can break at an unexpected time, leaving the clarinet basically unplayable. Carrying a spare dowel (IF YOU CAN EVEN GET THEM FROM BUFFET) takes considerable time to fix during an emergency. Asking around, the top techs, when overhauling or setting up a new Buffet, routinely replace the nylon pins with metal ones. Hmmmmmm........there may be pins of different strength materials. Many great techs also reconfigure metal pinned levers this way. The advantage is obvious, you don't have to continue to throw damping material in the joint to hold down the noise. I think some use teflon. Teflon type material should not break under any normal playing conditions and should remain noise free (minor thumping but NO clicking!!) virtually indefinitely. I would not put it passed Buffet to use a sub-standard part to save a few sheckels considering the appaling thumbrests they currently use. I've had Buffets with the fixed and with the adjustable thumbrest. The teacher I was studying with suggested that maybe I should move the thumbrest higher because of my "weird" finger positions. I moved it higher, and at first it seemed better but after only a few minutes of playing I had a pain in my thumb so bad that I couldn't believe it. I tried some other solutions but it was imposssible to play with the higher thumbrest without flexing the thumb which causes the pain. After a few days I moved it back down and no more pain. Just showing that for some people the regular position of the thumbrest is fine. Yes, I've had a very similar experience which I self inflicted. So under the heading of "Beating a Dead Horse," I will re-state that our Right Hand does NOT exist in a vacuum relative to the upper joint unless we decide not to use the lower sidekey for throat "Eb" and clarion "Bb." If the thumbrest is high on the lower joint and the index finger sits (at rest) at a point higher than that key, you will subconsciously push the entire clarinet with your thumb to reach it (of course what you're actually doing is temporarily lowering your hand since the clarinet anchored in your face is not moving). A recipe for carpal tunnel. In my case the lower thumbrest simply "forces" the thumb into a position that it can't be tense. When it was higher I had to put my thumb in a good position for the clarinet, but when it is lower the clarinet just leans on it comfortably. If it makes any difference I'm guessing my hands are about average (or just a little bigger) and my thumbs are long (probably longer than most with same size hands). By the way, although some (many?) players prefer a higher thumbrest I'm guessing if it was higher just as many would say it should be lower. "Hard rubber mouthpieces also contain sulphur, and probably contribute to tarnishing while a silver plated instrument is in its case." My Gigliotti doesn't do that at all, but another "big name" mouthpiece I have does it absolutely. For that other mouthpiece I have to put it in a ziplock bag with a silver anti-tarnish strip next to it in the bag. My Buffet (an ancient Albert system) had an adjustable thumb rest added before it came to me. I recently had a minor overhaul and the TR repositioned. Try this, if you like. Put your RH thumb and forefinger together. Now move your thumb away from you whilst keeping the two digits touching, to that point where the finger nail of your thumb is touching the side of your first finger. This is where the thumb and forefinger are now aligned on my clarinet. It's better than it was, but still not ideal. In actual fact, I think I'd prefer my thumb rest to be even closer to the middle joint, so that my thumb is positioned directly under the first finger. It would seem to be better from an anatomic and (for me) a comfort point of view. Having one's thumb and forefinger essentially in a crossed position seems unnatural to me, but that's how most clarinets compel you to hold them. My other (and more ancient) Hawkes & Son simple system forces me to position my thumb almost directly under the middle finger - this is no good now for this person with ageing joints. This will be looked at before long. I'm aware that the tone holes on a Boehm system are different to those on an Albert system, that is they are closer together, so this will impact on your ultimate choice of TR position. This is an old thread, but it still seems relevant. In my case, I had to give up the clarinet many years ago because of arthritis. I had surgery in 2014 and decided to give it another try, but had to quit again in 2015. I finally "discovered" the elastic neck straps and these, along with raising my thumb supports, have allowed me to resume playing my clarinet. All of my horns (Yamaha and Buffet) have adjustable thumb supports with rings for neck straps. I raised my TR about 3/8 inch (9mm) and this seems to be working well for me. 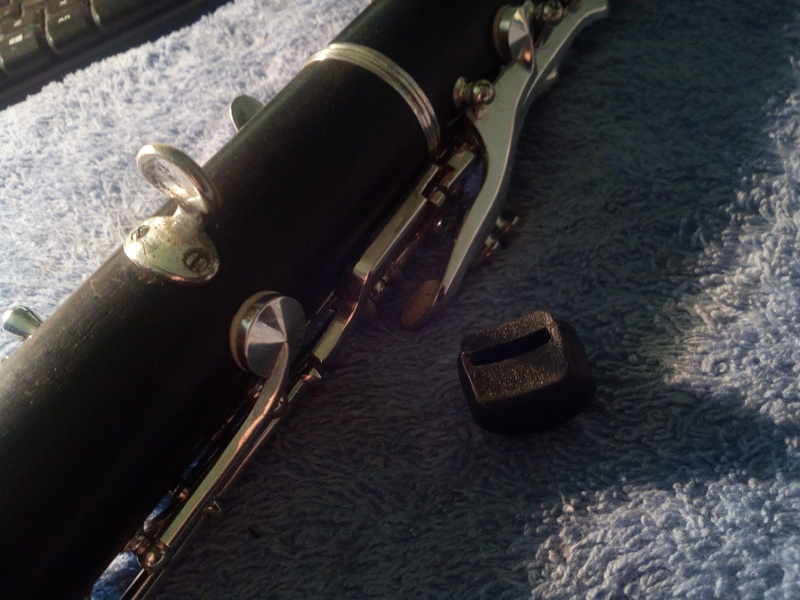 I recently bought a buffet R13 full boehm clarinet (the longer one with extra keys and a low Eb below low E), and indeed, the thumb rest was too low, and especially when reaching the low Eb key - my 4th finger wasn't able to cover the tone hole properly at times. A quick fix for me (without drilling any new holes) was to invert the existing thumb rest upside down. I then use a rubber thumb rest which happens to have a thick and a thin side which gives another 3-4mm of variation if required - see the attached picture for clarification. This then put my thumb more or less into line with my index finger, a much more comfortable position allowing curved fingers and no flattening of fingers on the low Eb key. I use the Kooiman rests. Love those things. The proper position of the thumb rest is when your right hand index finger is directly across from the first ring on the lower joint. I have a problem with my little fat fingers pressing the lower joint sliver key accidentally, leading to squawks ... I've mostly solved this with a multi-attack approach ... slightly higher thumb rest, stretching/relaxation exercises of my hands, lowering the sliver key slightly (not to fuzz out the note when key is pressed), softer pad on this key and increasing the spring tension. A too low thumb rest cramps my hand. 14 years after my last post on this subject and my thumb and right arm feel great with my 2011 Buffet R13 Prestige. Thumb position is not an issue and has not been since my last post. Buffet never changed the location of the screw holes when they changed from fitting the fixed thumbrest to the adjustable one, so immediately the adjustable one was effectively much lower than the fixed one and the only adjustment was even lower still. When I've fitted adjustable thumbrests to instruments (mostly oboes, cors anglais and some clarinets), I'll normally fit the baseplate higher up the joint just enough so there's even amount of adjustment up and down and the thumbrest itself is at the default position with equal amount of its slider either side of the baseplate. Or if specifically asked to, set the lowest position of the thumbplate to the default location and fit the baseplate much higher up the joint so all the adjustment is upwards which is usually better for players that use a thumbrest cushion. And during a service or overhaul when the instrument is all taken apart for cleaning and polishing, I make a mark on the slider to be sure it goes back as it was when it came in. More often than not there are dimples made by the grub screw or locking screw in the slider, so it will click back to where it was before it was taken apart. Wow! Another thread resurrected! Anyway, didn't read through all the thread but will tell you I find the most comfortable position is when my thumb is opposite of the index finger. That makes all factory installed thumb rests too low for me. I always move it on my personal instruments. I spoke with Francois at a TMEA or TBA when Buffet first started using their adjustable thumb rest and told him at that time it really wasn't accomplishing anything because the "highest" position was where the fixed thumb rest was located, explaining that most people wanted to move it up, not down. I have wrist tendonitis and thumb over-use problems. My occupational therapist said that the thumbrest was too low on my Buffet R13. I removed the original thumbrest and installed an adjustable thumbrest into the same screw-holes (so no drilling was needed). Then, I put the thumbrest on to the plate UPSIDE DOWN. For comfort: The thumbrest is shaped oddly on the underside, so I added a rubber thumb-rest pad. My thumb is pressed against the plate installed on the clarinet and the large screw that is used for adjusting the thumbrest, so I added moleskin to those spots. I also use the W.R.I.S.T. clarinet holder from Chicago Reed Company. It's a life-saver! You screw it onto your music stand, and rest your bell on it. It is very adjustable. With my old Normandy 4 I moved the thumb rest up 1/2" and canted it slightly up on the right to more closely match the angle of my thumb. I never did find a commercial thumb pad to my liking so I cut pads from dense foam insulation that is used to seal ridge caps on corrugated roofing. It is comfortable and easy to shape - I used a band saw and razor blade and a small pen knife to pierce the slot for the metal thumb rest. When I recently got a Ridenour Libertas I was dismayed to find the adjustable thumb rest, as many before have mentioned, was too low even when set at the highest setting - nowhere to go but down! I really did not want to drill holes in my new instrument to relocate the thumb rest so, like Claire9, I inverted the adjustable piece. That introduced two problems: first the the large adjustment thumb screw was in the way of my thumb; second, the inverted thumb rest was now too high. I replaced the large adjustment screw with a small screw from my Altoid tin marked "computer screws". Then I cut a custom foam pad that lowered the support point 1/2". I am a happy clarinetist.